Land Rover’s new Discovery, which it teased yesterday via our first ever look at the SUV’s front end, also has a “world-first” smart seat feature, which lets owners reconfigure their vehicle seating from anywhere with a data connection with an app on their smartphone. 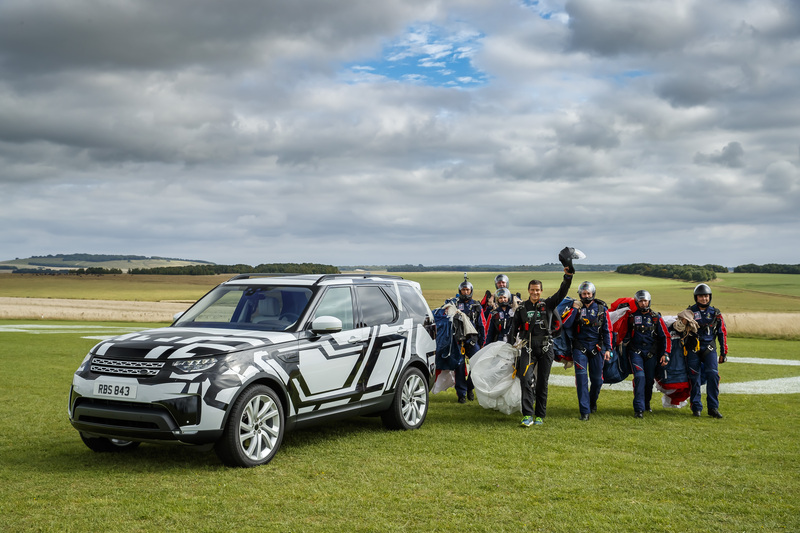 Naturally, Land Rover decided to show us how this works by throwing Bear Grylls out of a plane with six professionals from the Royal Navy Parachute Display Team to show us how it works when you’re free-falling at a rate of 125mph. It’s difficult to conceive of something that better fits the label “stunt marketing,” but it does still manage to illustrate the feature pretty well. The app lets you adjust the layout of the seats inside the car, turning it from a two-seater with plenty of cargo space, to a seven seater with two rear rows of seating in as little as 14 seconds according to Land Rover. The functionality is built into the Land Rover InControl Remote app, which is available free on iOS and Android. If you’re note falling from a plane and happen to be actually close to the Discovery itself, there are switches in the rear cargo portion of the vehicle, and on the C-pillar. Finally, you can raise or lower the back two rows from the main dashboard infotainment system touchscreen, too. We also get a decent look at the camo-painted Discovery in profile as Grylls drives his skydiving pals away, but Land Rover is still holding the big final reveal for September 28, 2016.